I just dont get it. I have read many times here and there that the dark blue r2's have been on cards also. Is there one absolutely certain way to know if you have an early bird r2? What is funny is that those are certified AFA. The people even take pictures of the AFA stickers to show you the grade but it does not say anywhere on that sticker that it is an early bird R2. People just put it on the description and think you will bite. But i think these is 2 definitions of early bird going around. One is the real deal. The toy comes from an early bird kit. The other one is just a sad sales tactic wherein the seller just puts the tag "early bird" in the title description of the toy to attract people. They are just saying that it is an early release of the toy version. Like dark blue r2s' or 3 lines Lukes'. a shame people are trying to mislead people by doing that. What is nice is that we have this nice website called imperial gunnery to inform us of all these nasty little scams. That being said. I wonder if AFA puts the baggies in the plastic casings if it is a baggie? Oddly enough i have seen a ton of AFA casing but for the love of god i cant remember seeing a baggie in an AFA casing.... am i wrong? or is it just me hallucinating ? I think if you were looking for an R2 that was specific to the EB set then you'd be looking for an R2 with a (dark blue dome) Im not sure why his dome is dark blue, possibly he caught it in the door. Dark Blue R2's can also be found on some early 12 backs. It’s been a while since I’ve been on this Platform- technical issues and so on. I find the Topic of the Dark Blue R2-D2 an Interesting One! I have about seven or eight two of which are Very Dark Blue. One was on a 12 back Star Wars Card another on an Early Empire Card. It is fascinating to observe how the paint work progressively becomes lighter with each New Figure. That is from the Original Solid Dome Sensor Scope right through to the Pop Up Lightsaber. The Decal Variations are numerous also from the Original and even within the Initial run of that Figure. It is the same With R5-D4. But note with Each R2 there is a Slight Drop Off in Quality. For Example the Decal of an Original R2 when compared with that of a Pop Up Lightsaber R2 Has a Greater Longevity in that it dose not yellow or yellow as much when on display or archived. The Latter Pop Up R2’s Decal is Rougher to the touch and the Texture can be seen when held under strong or simulated Day Light. Also note the Blue Bars on The Originals Legs are Very Dark Blue Also but Progressively become Lighter with each New Release and Variations. The Palitoy and Kenner R2’s are Naive Compared to the Contemporary Counterpart but there can be no mistaking who the Figure Represents. I’ve been in Love with the Vintage R2 since I’ve been a Kid and that Love has not Diminished! Did you have the same username last time you were here as I saw you are a new user now. That's some good info on the evolution of the dark blue R2 to its lighter blue version. I had a lot of technical issues for some reason as I could never seem to log in!? The Site would never accept my password so I had to go through the whole process again from scratch! Yes it is Very Interesting the History of Our Little Palitoy, Kenner Astromech! Depending on How Many you have in your Collection, you may also notice that one may have a red plastic chromed over Dome? I realised this from where the Dome was cut away from the sprue during production! This would be the R2d2 with Sensor- Scope on a Jedi Card if I can remember correctly? None of my other R2’s are like this? Not Even my Pop Up Lightsaber POTF R2’s exhibit this? They are cream/ grey/ green like the earlier editions!? However, the C3P-0 with Removable Limbs Figure on a Jedi Card with raised Bar and No COO is red plastic under the Chromed Exterior. Only the HK Version with COO is white/ grey underneath! Besides Collecting as a child and tinkering with the edges of that Collection as an adult I Never Thought For once How Fascinating the World of the Classic Star Wars Figure Could Be! They are almost Mythical in their Own Right! Such is their Legendary Status! 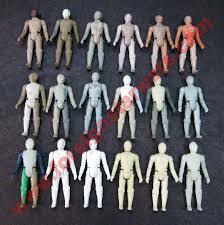 There are so Many Variations on one Figure Alone! Borrowed this pic from a rs thread. The droids; r2 domes of each type, c3po, and death star droid were all shot in whatever color plastic was already in the machines. They have all been found in many varieties of colors, pretty much complete rainbow of assortment. Why was this done? Well best guess is cost. No need to run through a ton of unusable plastic when changing out from one color to the next, when all you have to do is use the plastic up in one of these characters. They were all vacmetalized anyway, so who would see them. There are some really nice colors floating about, I have some myself even. I never thought about that? I had always Imagined that the different plastic was due to the Country of Origin or a later edition as opposed to what the manufacturers had left in the tank so to speak? But I guess that it makes sense practically and economically to use what was left during a run. On the Subject of the Galaxies most Famous Protocol Droid the Fixed Limbs Version in Particular it is Fascinating to see the Variations in this Figure also! I have four or five and they range from literally silver to a very rich and deep gold. On one of the gold Figures the Lacquer is so thick that his head can hardly move?! I believe they call this an “Un- Cracked” Figure? Also I have noticed the difference between the rounded and flat headed rivet or pin in his back? They alternate between the silver and gold C3P-0’s concurrently? In other words I remember them being bought broadly in the same time frame or not too long after? This Begs the Question of Which C3P-0 came First? The Silver or the Gold to really Gold and or the Flat Head Rivet or the Rounded One As this is a Feature in Both? The Vac Metallisation Process is Really Fascinating! It is the same Process that the Industry uses in the Production of Christmas Decorations. I watched Adam Savage on the the Tube with his 1/1 Scale C3P-0. Great Stuff! When I have a Spare Moment I will Post Some Pictures. With Regards to the C3P-0 With Removable Limbs- I have Both! One is a Red Based Plastic and the other a Pale Gold or Cream. The Latter are HK COO’s 1982 the Former No COO and Raised Bar 1982. The Frustrating thing is both Variations are Very Pale Gold Near Silver!? I have never been able to find a really, really Gold Variation? I Look Occasionally to see what’s out there in terms of a Truly Gold Variation with a HK COO 1982. It is like the proverbial Hens Tooth!? These Figures in Particular were on a New Empire Card and on a second Generation Jedi Card. On one of the gold Figures the Lacquer is so thick that his head can hardly move?! I believe they call this an “Un- Cracked” Figure? Movement is key to being unsnapped, or uncracked. The head may be unsnappped if it has not been moved too far in either direction. It is usually on a 3PO that has seen little play time or are new/MOC (but not always). The vacumetal process make it so the limbs need to be snapped to allow them to move freely. These are typically pristine, as close-to-mint-as-you-can-get examples. Subject: Re: How can people call a dark Blue R2-D2 an early bird?